I jumped on the Succulent Bandwagon! Succulents are so popular now. 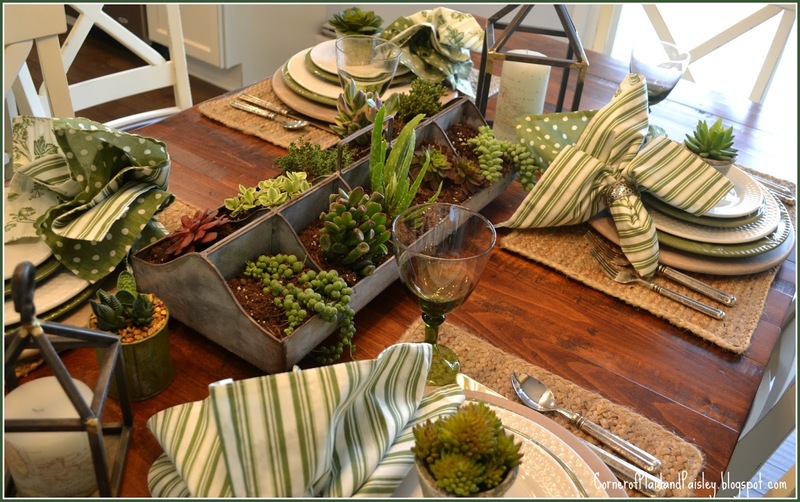 So of course I jumped in and did a Succulent Tablescape. The only succulent plant I was familiar with before this past year or so, when they got so popular, was chicks and hens. We used to have those lining our garden bed when I was little. Now there are so many varieties available. I think the second one in on this side of the tray looks like Shrek's ears! 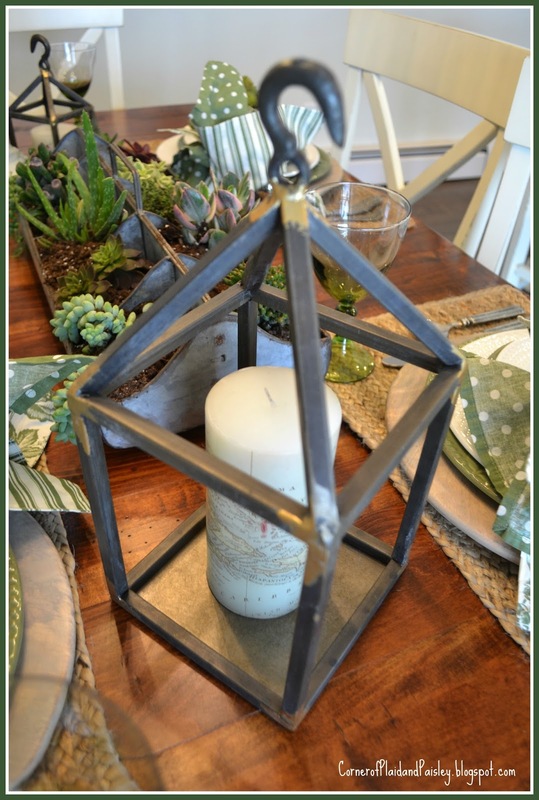 I found these galvanized lanterns, very reasonably priced. I may plant some of the succulents in a pot and put them in these lanterns instead of the candles I have here. 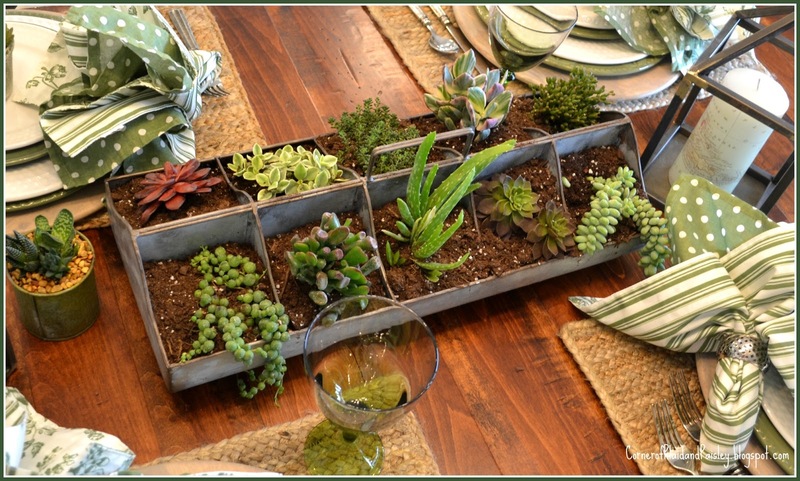 I don't think the succulent plants will last long in this galvanized tray because there is no drainage. There are a mix of fake and real succulents here. 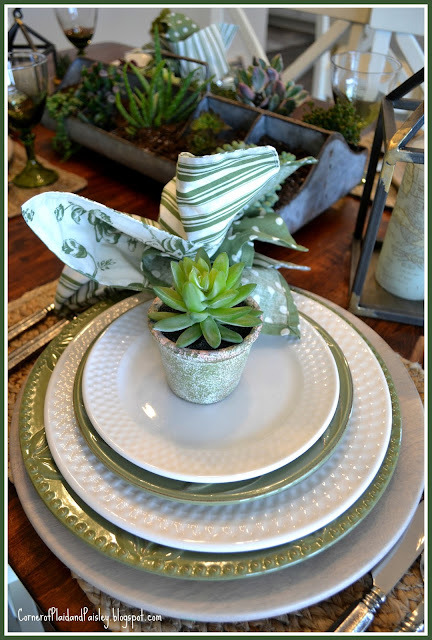 I have seen some bad artificial succulents out there, but I didn't think that these little pots on the place setting looked too fake! 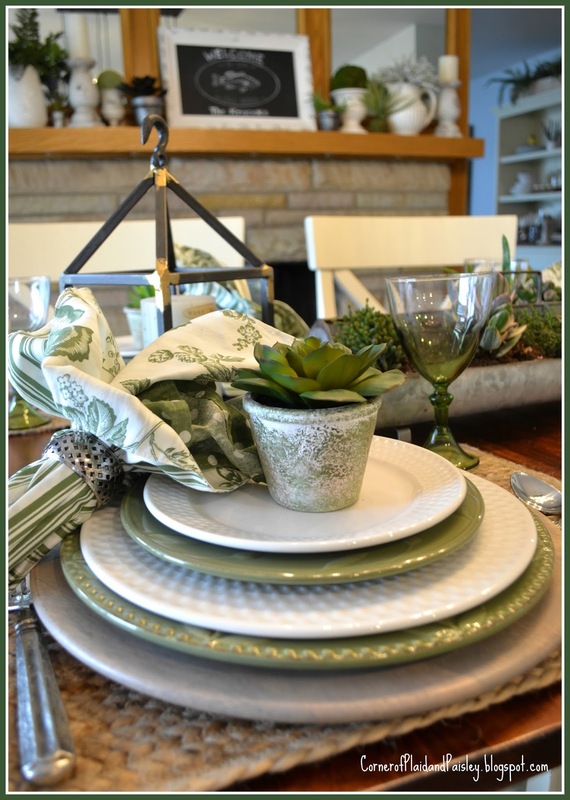 Are you all sick of my green polka dot napkins?! I have been using them a lot lately. It's funny, they were one of the cheapest sets of napkins I have bought, but probably the most used. Happy Mother's Day to all of you wonderful Mom's out there!! When I was in college my mother fell in love with succulents, and I thought they were just awful~ I have been slow to jump on the band wagon myself, but I really love how you used them on your table, really attractive! You might be changing my mind! Hens and chicks are a childhood memory of mine. 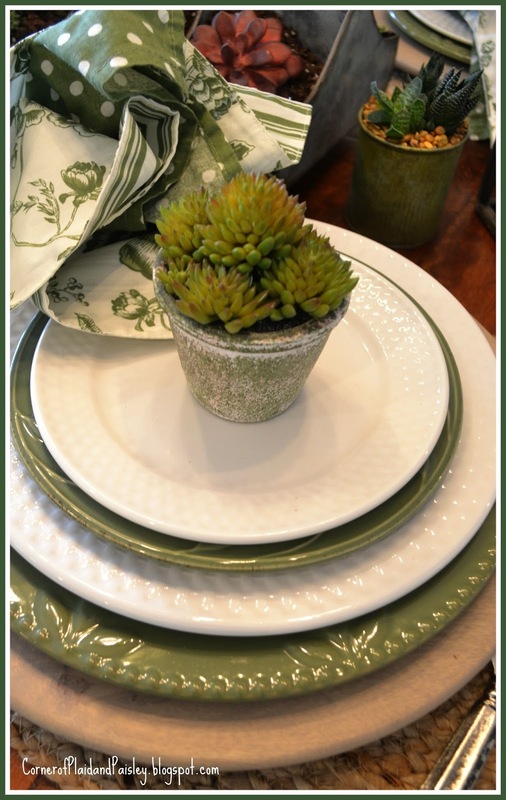 One Easter a few years ago, I used them as a theme for my centerpiece. I planted a silver basket with hens and chicks and a few other succulents and then added some hen and chick figures. It turned out pretty cute! That said, I'm not a big fan of succulents. We have some, but I prefer softer plants. Your display makes a cute centerpiece. I love your succulent tablescape. They should do good as long as they get plenty of sun and just a little water. Like two tablespoons of water every 3 or four day depending upon ambient temperature.